Urie, who has been married to Sarah Orzechowski since 2013 did not hesitate in his answer: ‘Exactly dude. ‘When people have asked me … whether I classify myself as straight, bi, or whatever I was like, “You can classify me as I really don’t care.” I don’t think it matters. I like people. He first mentions Brad Pitt then George Clooney is brought up. But the guy who really seems to top Urie’s list has never officially been named the Sexiest Man Alive by People Magazine. ‘Look at Ryan Gosling, bro! I’d totally make out with his face,’ Urie says. But for it to go any further, before he’d invite Gosling over for an evening of wine in front of the fire and watching Netflix with his wife, he’d want to get to know him first. 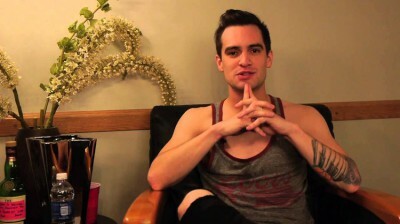 ‘I want to have a discussion,’ Urie tells the host, laughing. The discussion about Gosling (pictured with the back of Steve Carell’s head in Crazy, Stupid Love) starts at the 19:00 mark. WOW..WHAT GREAT LIPS..THIS GUY WOULD BE A GREAT DUDE KISSER..ETC.